Plastifab Industries has been in the custom shape business for over 40 years. With our experience in a large variety of materials as well as co-extrusion and tri-extrusion our profile capabilities are almost endless. We nurture long lasting relationships with our clients in P.O.P and Retail Industry. From shelf talkers, price channels and edge guards over jewelry, glasses and brochure displays to in-store designs for special occasions or holidays, we helped our clients capture their clients’ attention. Furthermore, our materials have been used many times to set our clients apart from others as well as to create some incredible art pieces,from sculptures on the New York Times Square, to logo displays in universities or atrium lighting in hotels. With our design support, in-house tooling and capacity we strive to support you from the initial design to the realization of the final display. In the industrial environment our custom profiles, rods and tubes have not only added more employee safety, but also improved processes. Profiles like protective covers, machine guards, bumpers and cable guards, as well as colored tubes and rods for signalisation helped our clients to improve their work environment and increase the safety of their facilities. 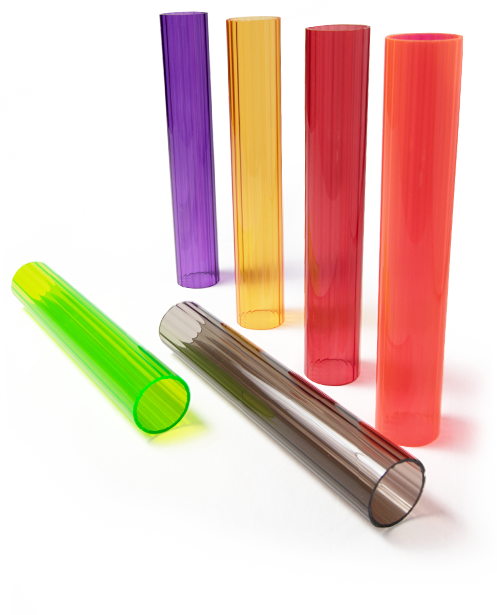 Materials like Polycarbonate, ABS, Acetal, Ultem, Noryl, PPS, PEEK and many more can be converted into custom rods, tubes and profiles to support industrial applications. The lighting industry is changing rapidly to accommodate LEDs, so does the market for light diffusing materials. With snap in designs, color matches and oversized profile capability we are able to let your design visions become reality. Check out our case studies to see a couple of examples of custom profiles for the lighting market. For straight lengths especially hanging form ceilings or standing up on floors, use tubing instead of rod. The hollow center allows for a better stability and provides a straighter and easier to install shape. Tolerance everything in your design has at least a critical one. Make sure to share this information with your suppliers to assure a fit for your design. Tolerance that do not match may give you trouble installing the parts. The easiest way to avoid installation problems, is to provide a mating part to the manufacturer to use in production. Colors are very important to your design.I If you have decided on a specific color make sure you have a sample piece of the color somewhere or at least a printed paper with the exact color which you can send to the manufacturer. Color-matching is not as easy as it seems, Pantone colors might look different on your swatch than on ours based on the years we work with them and the lights they have been exposed to. Same for screen or printer colors, as every computer and printer has different settings, therefore the actual color sample you are looking at while designing is crucial to get you that perfect match in the end. How to Get the best Design for your Needs? Sketch it - We are not kidding, when we say we make it happen from the scribbles on your napkin, but this is the minimum we need to understand what you envision and get you a professional drawing in the end. If you already have a professional drawing, share it, it can only speed up the process. Scale it - The critical dimensions, and information on potential mating parts is crucial for the development process. Once your manufacturer understands the dimensions and the shape they will be able to give you at least a ballpark price. Share it - The more we discuss the project and the design, the better it will be in the end. There might be ways for you to save a lot of money and time with simple modifications, which won’t impact the look of your design. Don’t be afraid to ask questions, and expect to get some from the manufacturer. This is the only way both of you can make sure the design will work in the end.